Forgive me for not remembering the exact show I was watching, but it was probably either on Discovery, NatGeo or the Science channel. Telescopes have found over 700 exoplanets. An exoplanet is a extra solar planet or a planet outside of our solar system. Most of the planets are gas giants however they have also found about 140 earth size planets. Scientists believe there is a chance that these planets might have life. They have found these planets using the Kepler Space Observatory. Kepler is uses a photometer to measure light in a fixed field of stars. When light dims, it might be the orbit of a planet passing in front of the star. The light might only dim by one percent, but it is believed that the dimming of the star is caused by a planet. 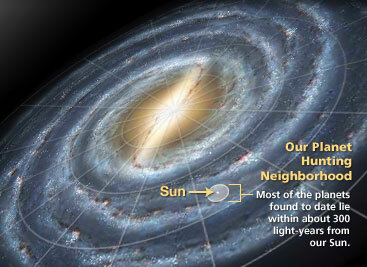 The Milky Way galaxy, our neighborhood in the universe, might hold 100 million inhabitable planets or planets capable of supporting life. Scientists believe that the sheer number of planets alone could be reason enough to believe in extraterrestrial life. I believe that perhaps there might be life, but I don’t believe it is ‘intelligent’ life such as you and I might consider ourselves to be. Microbial, plant, or maybe even animal life, but I just can’t believe in intelligent life. Like Valencia, you are free to believe as you choose, but I don’t believe. Still, with 100 billion stars in the Milky Way and perhaps 100 million earth-like planets, One to beam up Scotty. You are currently browsing the archives for the Exoplanets category.